Here we have the 128 Combi gas boiler from Baxi. This boiler is 89.1% efficient making it rated B for both heat and water. With the 128 you get an output of 28kW but it is also available in the 24kW (the 124) making this a perfect boiler for most homes. 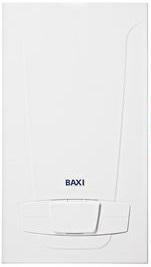 The Baxi 128 is both compact and lightweight weighing just 32.5 kg so is able to fit inside a standard 30cm deep cupboard making this boiler perfect for those small properties with not much room. You’re also covered with Baxi’s iron-clad 2 year guarantee.